Been scouring the Internet looking for that one Big Bang Theory shirt you can't live without? The very one that encapsulates your love for Howard and the gang perfectly? Look no further than this Big Bang Theory Green Bazinga T-Shirt with Black Cape! There's simply no going wrong here. How much room is there for purchase failure when you're buying a green Bazinga! t-shirt with a fully operational bold black cape on the back? Don't even bother to answer that one, in your head or otherwise. 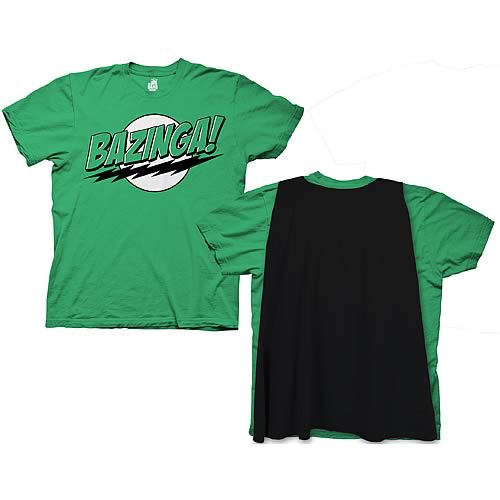 Preserve your place in the pantheon of awesome shirt-wearers with the Big Bang Theory Green Bazinga T-Shirt with Black Cape!